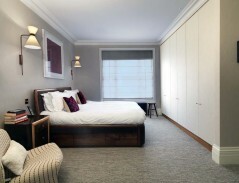 Projects for our clients’ bedrooms have included Art-Deco style beds, colourful kids’ rooms and walk-in dressing rooms in both traditional and contemporary styles. Some stunning effects have been achieved here by using a combination of fabric- or wallpaper- covered doors within solid timber frames. 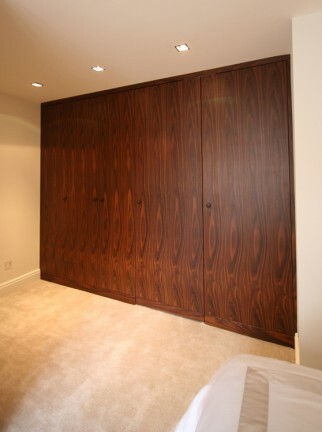 Bedroom Wardrobes with American Walnut interior and Santos Rosewood exterior. ‘Jib’ door through to en-suite bathroom. 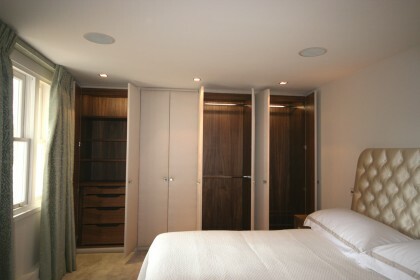 Bedroom Wardrobes with American Walnut interior and fabric covered doors. ‘Jib’ door through to en-suite bathroom. 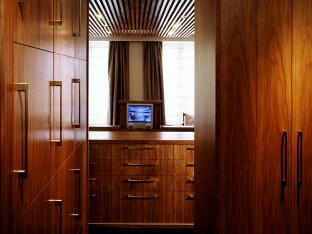 American Black Walnut veneered Wardrobe interior. 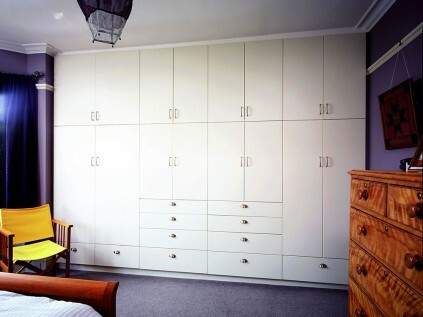 Wardrobe – spray-painted in a pigmented satin lacquer. Bed and Wardrobe made from American Black Walnut. 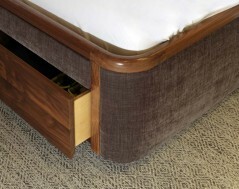 American Black Walnut Bed with fabric panels and Birch plywood drawers. Wardrobe with an American Black Walnut interior and fabric / paper covered doors. 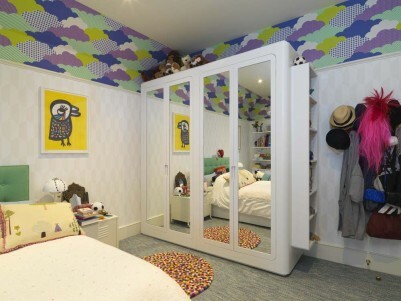 Children’s Wardrobes with mirrored doors and spray-painted throughout. 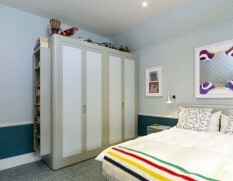 Children’s Wardrobes with a spray-painted interior and hand-painted exterior. Wall papered door centre panels. Wardrobe interior with pullout base and tarnished brass hanging rails. 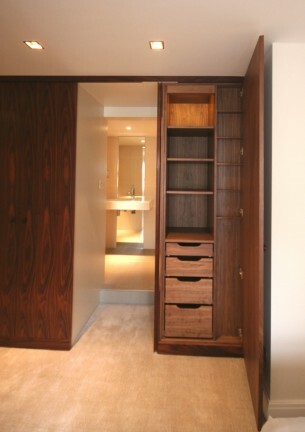 Wardrobe interior from American Black Walnut with internal drawers. 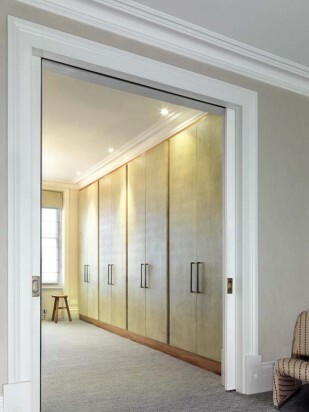 Dressing Room Wardrobe made with an Walnut interior and Shagreen covered doors. 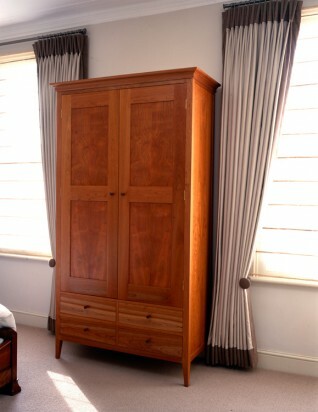 Free-standing Wardrobe made from American Cherry with Maple drawer sides and dovetail drawer construction. 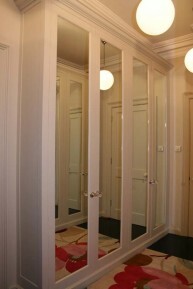 Wardrobe made with mirrored sliding doors. Interior spray-painted and exterior hand-painted. 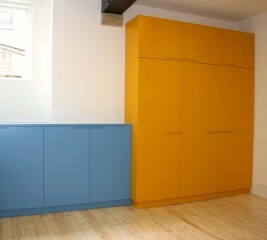 Dressing Room Wardrobe and cabinets spray-painted in a satin pigmented lacquer throughout. 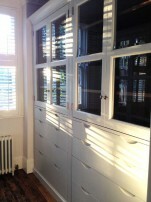 Bedroom Wardrobe, Dressing Table and Window Seat with storage and concealing radiator and air-conditioning. Walnut interiors and hand-painted exteriors. Dressing Room Cabinetry made with a Walnut interior, hand-painted exterior with glazed doors. 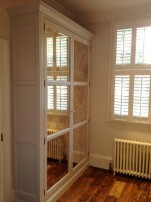 Dressing Room Shoe storage cabinet with a Walnut interior, hand-painted exterior and doors glazed with antique mirror. 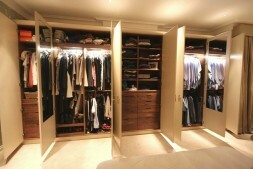 Dressing Room Wardrobes with tarnished brass hanging rails, pullout bases and interior lighting. 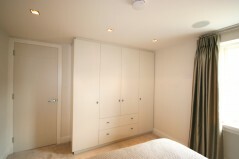 Guest Bedroom Wardrobes with Study area. Oak interiors and hand-painted exteriors. Interior lighting and lighting detail on top. 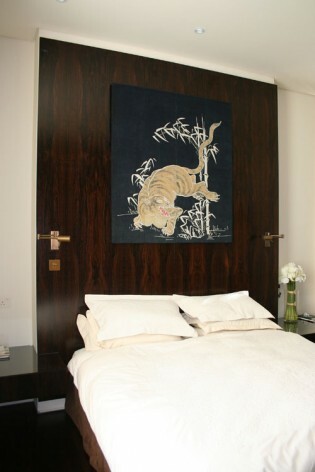 Master Bedroom Wardrobes with Oak interiors and hand-painted exteriors with fabric papered doors. Interior lighting and lighting detail on top. 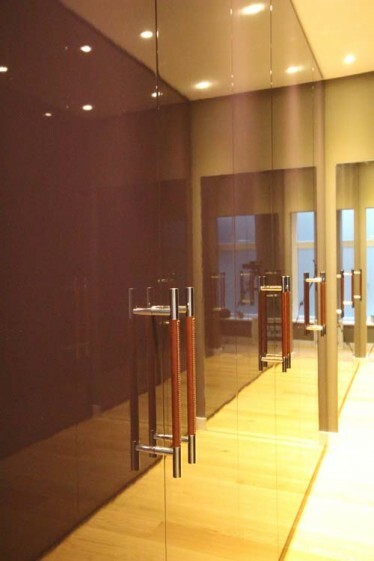 Dressing Room Wardrobes with spray-painted interiors and mirrored doors and hand-painted exteriors. 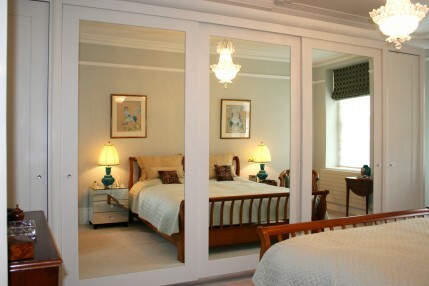 Mirrored door Wardrobes with white spray-painted interiors. 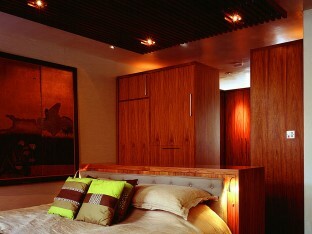 Bedroom suite made from veneered American Black Walnut throughout. Bedroom suite made from veneered American Black Walnut throughout. Bed with ‘chest of drawers’ headboard and foot of bed with elevation television. Bedroom suite made from veneered American Black Walnut throughout. 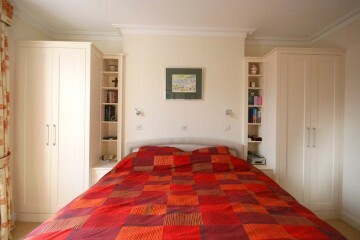 Bed with ‘chest of drawers’ headboard. 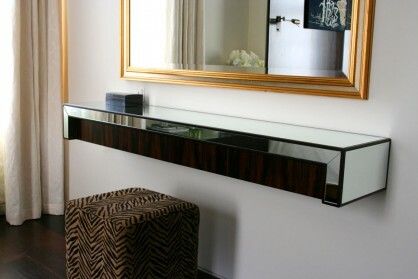 Macassar Ebony veneered Headboard and wall-hung Bedside Tables. 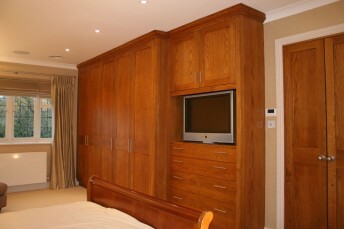 Wardrobe veneered in quarter sawn European Oak. 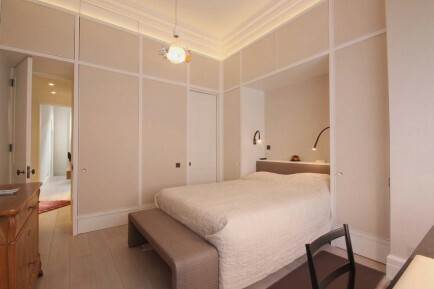 ‘Pied-a-terre’ – Wardrobe / Headboard / Room divider. White spray-painted throughout with reclaimed Teak end panel and headboard. 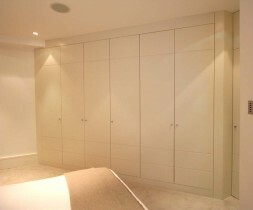 Wardrobes separating Bedroom from en-suite Bathroom. Spray-painted interiors, bevelled antique mirror door panels and paint-effect exteriors. Wardrobe / storage cabinet spray-painted throughout. 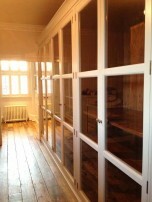 Wardrobe made from stained Oak. 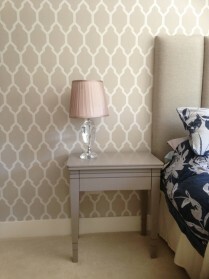 Bedside Table with a satin Grey lacquered finish. 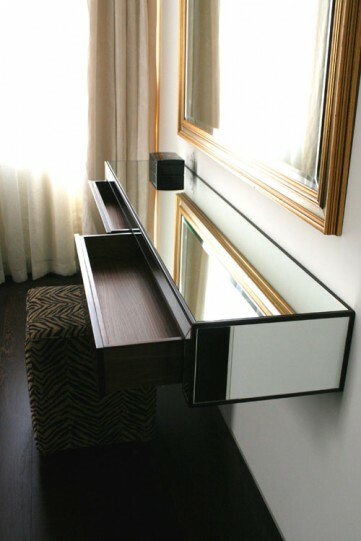 Wall-hung Dressing Table made from mirror and Macassar Ebony. 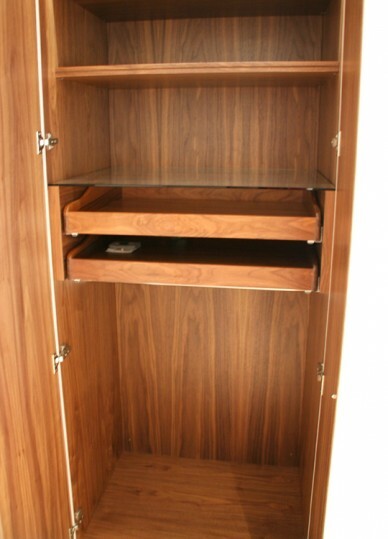 Wardrobe with a Walnut interior and exterior spray-painted with recessed handles. 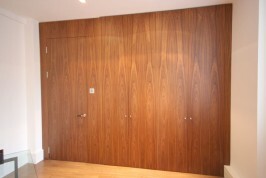 Walnut veneered wall of cabinets with ‘Jib’ door leading from room. 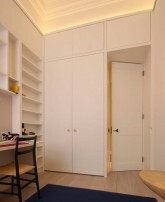 Wardrobe fitted to angled ceiling. Spray-painted throughout. 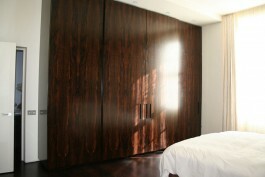 Sliding door Wardrobe with a brown spray-painted interior and Macassar Ebony veneered doors and exterior. 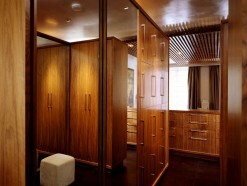 Dressing Room Wardrobes with Walnut interiors and high-gloss lacquered exteriors. 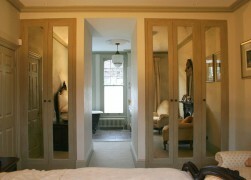 Wardrobes with spray-painted doors and Walnut interior. 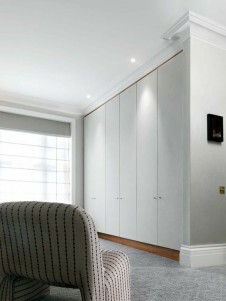 Angled Wardrobe spray-painted throughout with groove detailing on doors. 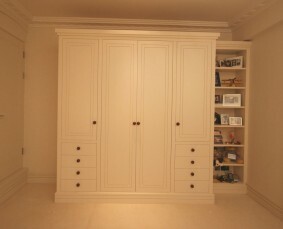 Dressing Room cabinetry made from Oak veneered sheet material hand-painted. 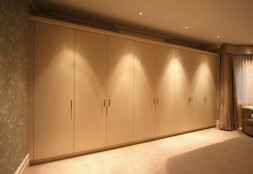 Children’s Wardrobes and cabinet spray-painted with recess handles. 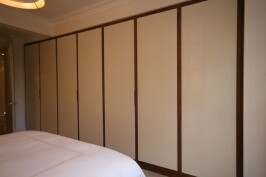 Hand-painted Wardrobes either side of bed.